Just worship Sri Gaurahari, who is always affectionate toward His devotees. He is the same Supreme Godhead, Krsna, who sported in the cowherd pastures of Vraja and stole the hearts of Nanda and Yasoda. On the direction of Nanda Maharaja, Krsna, the holder of Govardhana Hill, sits down, and then all the cowherd boys, along with Krsna’s elder brother, Sri Baladeva, sit down in rows to take their lunch. They are then served a feast of sukta and various kinds of green leafy vegetables, then nice fried things, and a salad made of the green leaves of the jute plant. They are also served pumpkin, baskets of fruit, small square cakes made of lentils and cooked down milk, then thick yogurt, squash cooked in milk, and vegetable preparations made from the tower of the banana tree. Then they receive fried squares of mung dahl patties, and urad dahl patties, capatis, and rice with ghee. Next, sweets made with milk, sugar and sesamum, rice flour cakes; thick cooked-down milk; cakes floating in milk; and sweet rice. There are puns made with white flour and sugar; puns filled with cream; laddus; and dahl patties boiled in sugared rice. Krsna eagerly eats all of the food. In great ecstasy and joy Krsna eats the rice, curried vegetables, sweets, and pastries cooked by Srimati Radharani. 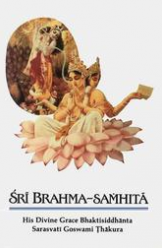 Krsna’s funny brahmana friend Madhumangala, who is very fond of Laddus, gets them by hook or by crook. Eating the laddus he shouts, “Haribol! Haribol!~’ and makes a funny sound by swapping his sides under his armpits with his hands. Beholding Radharani and Her gopifriends out of the courters of His eyes, Krsna eats at the house of mother Yasoda with great satisfaction. After lunch, Krsna drinks rose-scented water. Then all of the boys, standing in lines, wash their mouths. After all the cowherd boys wash their hands and mouths, in great bliss they take rest with Lord Balarama. The two cowherd boys Jambula and Rasala then bring Krsna pan made with betel nuts, fancy spices, and catechu. After eating that pin, Sri Krsnacandra then happily goes to sleep. While Krsna happily takes His rest on an excellent bedstead, His servant Visalaksa cools Him with a fan of peacock feathers. Lalita-devi and the other gopis then receive the remnants, and within their hearts they sing the glories of Radharani and Krsna with great joy.